In order for the sentencing enhancements of the Three Strikes Law to affect your current criminal charge, the prosecution must prove that you were convicted of a prior strike. The prosecution will first file the charging documents alleging that you were previously convicted of a serious or violent felony under California Penal Code sections 1192.7 or 667.5. The prosecution must then submit evidence proving that you were previously convicted of one of these enumerated offenses beyond a reasonable doubt. The prosecution will present evidence, such as your record of conviction to prove a prior strike under California PC 667. For prior adult convictions, the prosecution will submit your record of conviction for the court to examine. This is usually sufficient to prove a prior strike so long as the prior felony conviction on your record is listed as a serious or violent felony under the California Penal Code. The prosecution can also use booking photos, fingerprints, or any other evidence that show you are the person named in the record of conviction. For prior juvenile convictions, the prosecution will submit your sustained juvenile petition (the juvenile equivalent of a record of conviction). In order for a prior juvenile conviction to count as strike offense, it must be considered a serious or violent felony under the California Penal Code and also listed under California Welfare and Institutions Code 707(b). In addition, you must have been at least 16 years of age when the offense occurred and your were found to not be a fit and proper for juvenile court in order for the juvenile conviction to count as a strike. Even if the prosecution is able to prove your prior felony strike convictions, there is still a chance that your attorney can alleviate the punishment associated with a conviction under California’s Three Strikes Law. By filing a Romero motion with the court, your defense attorney can ask the court to dismiss any prior strike allegations on your record in the interests of justice. In deciding whether or not to dismiss these allegations, the court will consider the totality of the circumstances including the nature of your current charge, your criminal history, and the facts surrounding your prior strike felony convictions. If the judge determines that you are not a proper subject for purposes of the Three Strikes Law, the court will disregard your previous strike offense(s) and sentence you according to normal California Penal Code guidelines. However, your prior felony strike convictions will not be removed from your record but simply disregarded for purposes of determining the sentence for your current felony conviction. 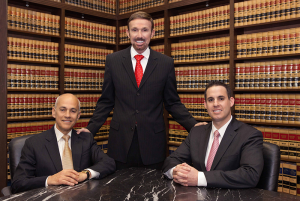 With over 30 years of experience, our lawyers are ready to fight for your freedom. If you or someone you know has been charged with a felony strike offense in California, you need to contact an experienced defense attorney who is dedicated to giving you the best representation possible. With offices in Orange County, Los Angeles, San Diego, San Bernardino, Riverside, Ventura and Victorville, Wallin & Klarich has successfully represented clients facing charges for serious or violent felonies for over 30 years. Drawing from our extensive experience, our talented defense lawyers will thoroughly review your case and develop an effective defense strategy to win your case. Call us today at (877) 4-NO-JAIL or fill out our intake form. We will be there when you call.